Since choosing a college is an important decision, you want to be sure that you use the right criteria in your college search. However, many times people have some wrong reasons for choosing a college. Those reasons oftentimes lead to dropping out during freshman year, changing colleges in the midst of a degree, and even stopping college altogether. The danger here is obvious. High school romances rarely last and once the romance ends, so does the love for the college. Friendships, while many last a lifetime, are no reason to make a college choice. Friends oftentimes have different educational goals and career paths. Even if they line up, evaluate the true reasons for choosing the college and be sure it’s not for friendship. When that friendship dissolves, it taints your view of the environment. Many times teens choose schools because it’s the last place their parents would want them to go: rebellion. Choosing a school just to get far away from home is not a valid educational decision. Being a Texas Aggie fan or a Texas Longhorn fan or a Notre Dame fan is no reason to attend their college. Investigate their academic programs and choose it if it gives you the best education for your needs and for your dollar. You would be surprised how many students choose schools that are ranked high as a party school. They convince their parents it’s for the academics, but truthfully it is not. Too much partying equals academic failure. Besides, even the most stringent academic institutions have parties. Don’t just look at colleges close to home. Check out some schools that are a little further away. It will increase your options. It’s perfectly acceptable to not know what you want at any point in the search. But simply applying the “enny meeny minny mo” technique is not a good way to choose. Until you have investigated how a college gives out financial aid, don’t discount pricey schools. You might be surprised at the amount of aid you receive that will offset the high tuition. Many teens just slide in to the most comfortable place: they got an email from someone; their friend suggests it; their parents went there. Neither of these are good reasons to attend college. This is not a reason to choose a college. Keeping up with the Jones’ or trying to impress your friends will only result in being unhappy at school. 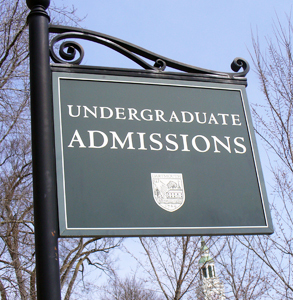 The best colleges are sometimes the ones that have a high rate of acceptance. Research is the key to finding out the benefits of these schools. All colleges offer an education, but not all colleges are the same. Programs, athletics, campus life, and even teaching styles vary. All of these can affect the overall college experience. Never assume anything about a particular college until you investigate and gather information. Opinions vary and at any given time you will always find someone that loves or hates a particular school. It’s common to change your major after taking some of the courses and realizing it’s not a field that interest you. Make sure the college has a variety of majors available just in case you change your mind. Since choosing a college requires a substantial monetary investment and affects your future career goals, make choices based on the right criteria. Choosing for the wrong reasons can be costly. Great article, Suzanne. Great stuff as usual. Great points! I probably would have made a more emotional decision, based off what my peers were doing, had I enrolled in a college at 17. Bookmarking and sharing! Great point, a college is an important decision, we want to be sure that we use the right criteria in our college search.